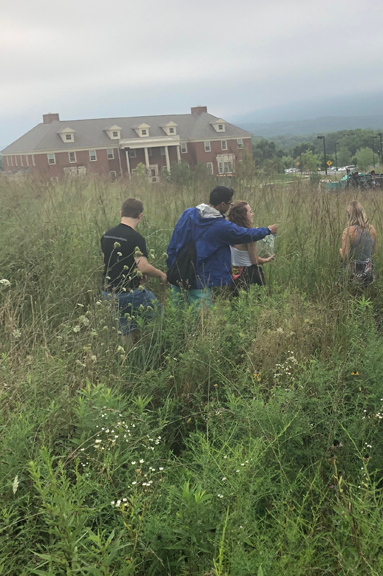 On the first day of Arts First, Program Manager, Andrew Ciotola, Program Assistant, Dan Newman, Biology Professor, Mark Spiro and I led First-year students and Second-year mentors to Bucknell Farm, an in-process space with fields of wild flowers. Mark told students they could liberally pick flowers; I explained we would experiment with making dyes and using stalks as fibers. 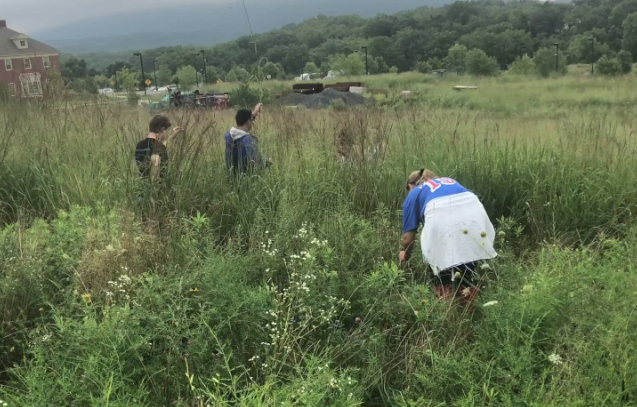 “Foraging” became a new concept and source of humor for students. Secretly, I think they enjoyed being outside. Foraging at Bucknell Farm. August 9, 2018. Arts First, 5-day intensive collaboration with incoming First-year students and Second-year mentors. Bucknell Farm is a new project in progress led by Biology Professor, Mark Spiro. Students will learn about food production and food security. For Arts First, we learned about connections between plants and textiles, experimenting with plants and flowers to make dye and fiber.